I spent a delighted half hour exploring Marla Olmstead’s brand new website. 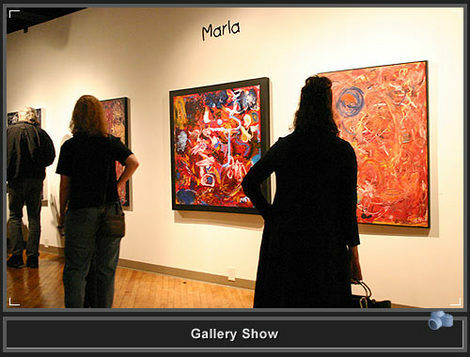 It is an incredibly well-done presentation of Marla as a personality and as a painting phenomenon. Visible Motion has combined Flash animation, videos, sound, and pictures of Marla, her paintings, and her family into the most engaging and esthetic personal public relations website I have ever seen. From the music of Brudda Iz (Israel Kamakawiwo’ole) at the opening to the multiple treasures in the Photo Gallery and elsewhere, every moment spent on this site was entertaining. 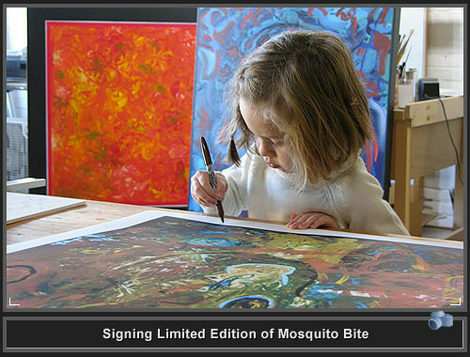 Fans of Marla Olmstead will get a much closer view of this charming child artist and will see the reactions of people at her gallery showings. There are a few momentary snatches of Marla painting, which will not satisfy the naysayers, but I am willing to enjoy what I see and will wait expectantly for more footage. says more than she can. impression. There are too few contemporary artist who do that to me. see as much of Marla Olmstead’s work as I can. Link: Ripples: post-corporate adventures: Marla Olmstead has a brand new website. This girl is amazing and so cute you just want to reach in the computer and pinch her cheeks.